When the bus stopped at the last stop before we entered the grays of the desert everyone took their handbags with them. Their handbags were filled with rough cut jade stones. Blue. Green. Gold. The stones looked like nothing but you could buy a brand new Cadillac with what was in one fanny-pack. And that’s after you take into account the 200 percent luxury tax imposed by the domestic-minded Party. Hotan is a strange town in Southern Xinjiang across the Pamirs from the Wakhan Corridor. Dust in the air gives everything a yellow tint. Under that weird sky it’s easy to feel weary and wary: a heavy combination. Greasy Han migrants from Sichuan with chains around their neck to signify new-found wealth argue with local taxi drivers in garbled Uyghur. Catching the tone of city Chinese these shifty drifters overcome their shyness and suggest rundown roadhouses: simple and cheap they say. Ignoring what they say we ask for the People’s Square where we encounter a tall freckle-faced British boy next to the statue of Mao shaking hands with a Uyghur farmer. He recommends a hotel next to the bus station. The squat lady of the inn is an aging Uyghur woman who speaks Chinese like a cadre. Stepping over piles of rubble in the courtyard we find our room. The ninetieth anniversary of the communist party was on, so the brand new flat screen TV was singing with Red Songs. The room is small, roughly square, long dark hairs on the sheets. The bathroom is latched by cramming a broken chopstick into the barrel slide. Water from the sink runs into a big tin basin on the floor. Outside in that beautiful light pigeons are being butchered, a small naked boy is being covered with the blood against illness. In the street a traumatized bronze American describes being attacked by a gang of marauding Uyghur children as she tried to repair a flat tire on her bicycle. Her shirt had been ripped in two by the ten-year-olds. An old Uyghur woman threw a pot of boiling water at the boys to drive them away she said. In the market teenagers with carefully preserved fine dark hairs on their upper-lips sold finely polished faux leather shoes, men mixed dyes made from rare minerals, they shaved each others heads with straight razors, they sold horse heads cooling in coagulating pools of blood, and miracle medicines by the box or by the grinding of dried plants gathered from the desert according to the old ways. Pakistani merchants peddled gold to women draped in hand-made veils of the finest quality silks and cotton. Friends told us wearing silk is forbidden for Muslims. Underemployed men in their twenties passed around handfuls of uncut jade on Sunday, a self-trained mullah with a long black beard read me a passage about Jesus from the Koran. Camels stood by. The donkeys wore sweat pants over their front legs against the flies. On the hot nights in July the children of the city ran through the fountain fully clothed outracing the policemen also fully clothed. Groups of women, the wives of soldiers and jade merchants from Henan and Shandong dance to Mando-pop under the statue of the firm hand-shaking Mao. We ate French fries at the Best Burger underneath the air conditioner. People stared at us everywhere we went until the strange light began to fade and every cat began to take on different shades of gray. We walked by city blocks reduced to rubble until we came to a small glass fronted office in which little dollhouses had been set up by real estate moguls from Hunan in order to convey what a dream condo might look like, separate beds for you and the missus, a big flat screen TV. One week now the new transparent Party Secretary from Hunan will cut a red ribbon over the new Kashgar-Hotan railroad. 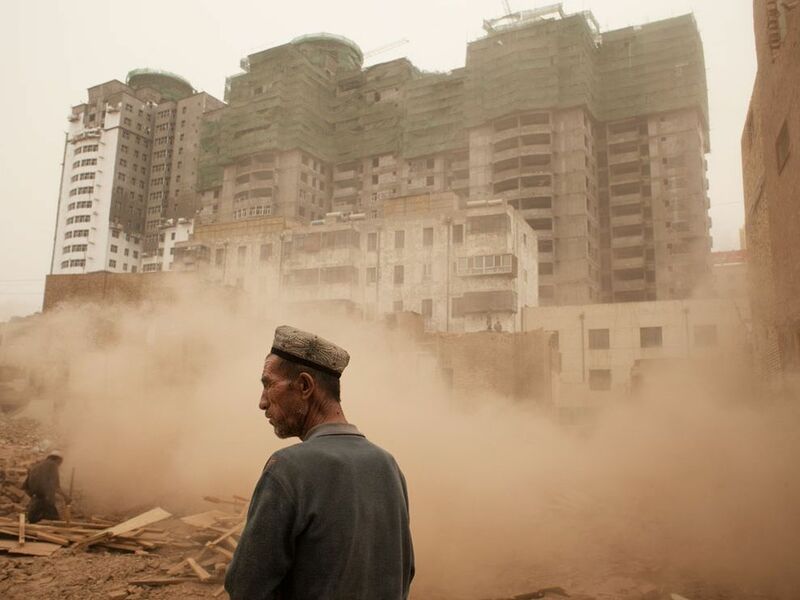 In three weeks 30 Uyghur jade diggers armed only with preternatural self-confidence will be shot dead in a protest against the take-over of their access to the White Jade River. These are the images I conjure when I encounter the work of photographer Carolyn Drake. Although based on my own perceptions and memories of encounters over the past two years, when I look at her pictures in the Wild Pigeon project they all come back. Since she said her purpose was “to document the nodes of the Uighur network: the truck stops, livestock markets, secondary schools, and county offices where Uighurs connect with each other, sometimes furtively,” the strange palate of her images is exactly that which I encountered. Beautiful surreal skies punctuated by clay houses of complex asymmetry rising from the same earth of which they are made. Populating the streets that by happenstance remain in-between are people made of blood, bone and steely thoughts, quietly existing. Interestingly what she was attempting to do while working with a writer Ilan Greenberg was “to create a composition that reads and looks like a sort of Uighur cultural topography of the moment. . . .” While their project was “not cinematic in approach, the director Robert Altman’s technique of folding unrelated yet connecting storylines into each other“ provided them with inspiration. To the careful viewer this synchronal narrative is indicative of something deeper. What they are doing presenting us with pictures of “how Uighurs conspire to pass on their constrained cultural identity.” For me it seems crystal clear: they were looking for a Xinjiang style, a charm which gave life meaning. They wanted to put their experiences of these lifestyles into a language which filled in lacunae and gave us a fuller picture of how life is persisting in the Chinese desert. What these pictures look like really is a cultural topography of the moment in Southern Xinjiang. Ms. Drake creates a landscape populated by desperados, mystics, tinkers, peddlers, farmer-butchers, barber-storytellers, work-weary waitresses, sad-slow dancers, mourning brides. You can taste the dust, the grit, you can hear the high whining call of the girls, the last bellow of the cow before the fountain of blood returns to dust, and through every door, across every space, in every corner you can sense the leaden gaze of men staring deep into the long far blank distance. What makes these pictures so uncanny is not just the oddness of the light, the curious juxtaposition of forms in the composition, not even the beautiful depth of the reds and blues against the beige of the dust: it’s that these images do all those things simultaneously and still maintain the quiet dignity of the characters in the midst of their lives in disparate locations. There is a stillness, a thoughtfulness in every frame of life. Despite the harshness of the natural world, the arbitrariness of the social one, still life goes on. It still stands.